Recently, people have been asking me if WC was ready for Kindergarten... I've been replying that yes, I think she is, but we're not sure if Kindergarten is ready for WC! Really, today went fabulously! I had the opportunity to meet with her new teacher on Monday morning and was reassured that the school would in fact choose the right placement for our girl. And after getting the chance to meet with P's teacher on Tuesday night, I know he is in the right place as well. Strangely, his teacher had eye issues and surgery similar to P's! When I told him that he was amazed.... he said, "She'll understand what I see!" So we're off to a fab start! 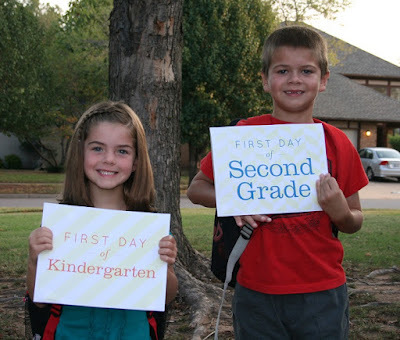 I'm enjoying see all my local friends post their first day pics today as well... these kids are growing up so fast. Wow...He looks SO much older in this photo. He's really growing up! Did you realize you used their real names in this post? I cannot believe how big they are! And totally jealous. We don't start school until the 8th of September.